If your ideal hike involves panoramic mountain views, ancient trees and therapeutic hot springs, it’s time to head west. The Western states have the highest peaks in the country — which make for unparalleled views as well as some of the steeper, more strenuous hikes in the U.S. (Add a heaping dose of low humidity and high altitude to the mix and you've got yourself a real challenge.) But not to worry — there are options for even those first-time hikers amongst you on this list of six unmissable spots. The Maroon Bells, CO Located 10 miles west of Aspen in a glacial valley, the Maroon Bells are a perfect spot to take in the astonishing beauty of the Rocky Mountains. This is the most photographed place in Colorado for a reason — the hike offers breathtaking views of alpine meadows, snow capped mountain peaks and all kinds of wildlife. Hikers can choose between a quick, scenic one-mile hike around the lake or opt for a more challenging 3.6 mile path on the rugged and rocky Crater Lake Trail. Muir Woods: Redwood Forest, CA Show the National Park Service some love for its 100th birthday by visiting one of the many splendid national parks around the country, like Muir Woods in California’s Redwood Forest. Nothing is more peaceful and awe-inspiring than hiking in the cool shade of towering Redwoods, the tallest trees in the world. A note to visitors: Parking at Muir Woods is extremely limited. 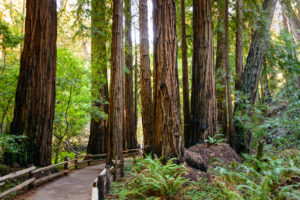 Park rangers recommend either using the Muir Woods Shuttle or avoiding visiting the park during peak hours. Humphrey’s Peak, AZ If your idea of Arizona is all flat desert landscape and canyons, think again. Humphrey’s Peak, often referred to as Arizona’s “Little Colorado,” is the highest summit in Arizona, with an elevation of over 12,000 feet. The 5-mile long Humphrey’s Summit Trail gets you to the top (10 mile hike round trip), so you should definitely plan on making this hike a full day event. Don’t forget to pack your windbreaker and some extra layers because it gets pretty windy up there! Hoh River Trail, WA Hiking the The Hoh River Trail is pretty much the closest you can get to a magical fairyland without stepping into a Disney movie. 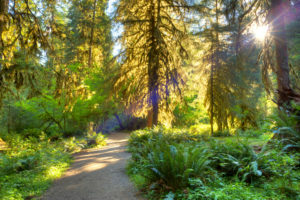 The hike is 10.6 miles round-trip, but with a minimal elevation and a wide, open path through the rainforest, it’s a relatively easy hike for all experience levels. Plus, there are great places to stop along the trail, including Five Mile Island — a great, scenic spot to stop for a picnic lunch! Grand Tetons, WY The Grand Tetons are a nature lover's play land. In addition to over 200 miles of hiking trails, this National Park has bike paths, horseback riding, climbing, fishing, and birdwatching as well as many other activities. Beginner hikers will enjoy the 3 mile Taggart Lake Trail that offers stunning lake and mountain views. For those who want a challenge, the 15-mile hike to Lake Solitude takes you past wildlife, wildflowers, and waterfalls — what more could you want? If you want to go beyond the day hike and make your trip to the Grand Tetons into an extended affair, consider camping at the serene Jenny Lake. Conundrum Hot Springs Trail, Aspen, CO At 17 miles round trip, the Conundrum Hot Springs Trail is definitely not a casual hike. Many people choose to camp near the springs and make the hike a two-day adventure and include soaking in the springs ... and soaking up their surrounding beauty. Be aware: Conundrum Hot Springs can get pretty crowded in the peak seasons (especially summer weekends), so plan accordingly if you’re looking to have the ultimate peaceful retreat.